I am committed to working with communities and using local ways of knowing as a starting point in improving community livelihoods and ensuring sustainable resource use. 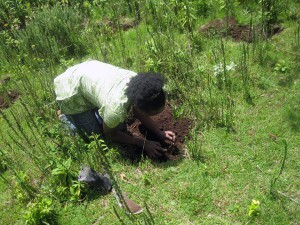 Preparing for tree planting activities with the Green Belt Movement in the Aberdare Forest Reserve, Kenya in December 2014. 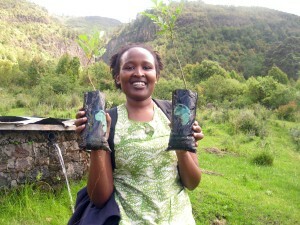 I was born and raised near a natural, indigenous protected forest in Meru, central Kenya. It was only because of the waters flowing from this forest that I did not have to walk for long distances to fetch water, a task expected of girls in my community. This forest and its critical watersheds were protected through a traditional custodianship system that is still applied to date. This drove me to study environmental conservation and later on, work in the cultural heritage conservation sector. Prior to starting my PhD program, I had the privilege to work with and learn from diverse communities on conservation projects in Kenya, Tanzania, Uganda, Malawi, South Africa and Australia for eight years. During this time, I served as Manager for Community Projects and Outreach at The Trust for African Rock Art (TARA), an organization whose work is endorsed by Kofi Annan and Nelson Mandela. The programs I was involved in, and helped initiate, were designed to ensure prudent utilization of natural and cultural resources, and improvement of community livelihoods. Through this practical work, I realized that every community holds vast reservoirs of knowledge, which I believe represents an untapped resource. I strongly believe that the answer to the long-term conservation of natural resources lies with empowering, and working with, local/indigenous communities. To this end, my PhD research explores the potential for forging sustainable people-forest relationships in the Kenyan context. 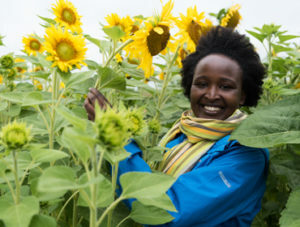 I am inspired and driven by the work of Nobel Laureate Wangari Maathai who urges us to do the best we can as a collective of individuals, working apart and together. Her poignant words are as seminal today, and for the future, as they were during her initial efforts in sustainable forest management: “Those of us who have witnessed the degraded state of the environment and the suffering that comes with it cannot afford to be complacent. We continue to be restless; if we really carry the burden, we are driven to action. We cannot tire or give up. 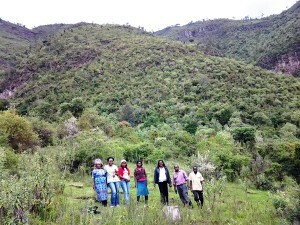 We owe it to the present and future generations to rise up and walk” (Maathai, 2010). 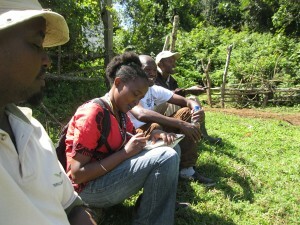 Interviews with research participants in the Aberdare Forest, Kenya in December 2014. Planting trees with the Green Belt Movement in December 2014. With the community in the Aberdare Forest Reserve, Kenya in December 2014.